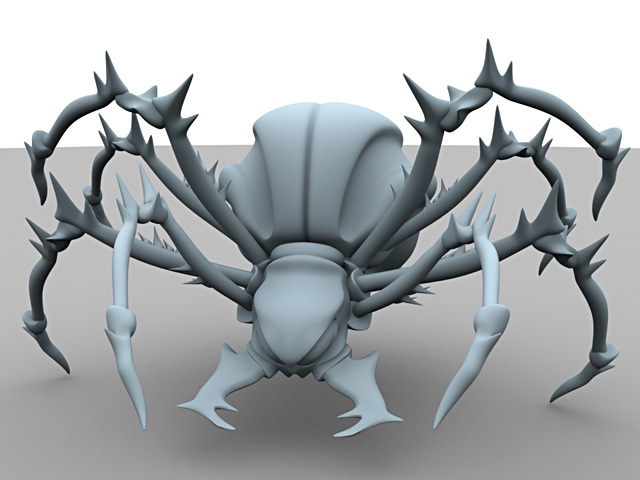 Below is a gallery of images I created using a couple of different 3D modelling and animation packages. 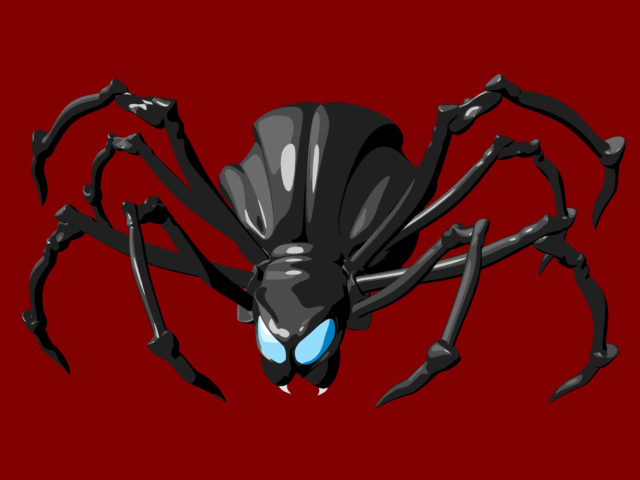 Click on any thumbnail to see a full-sized 640x480 version of the rendered image. 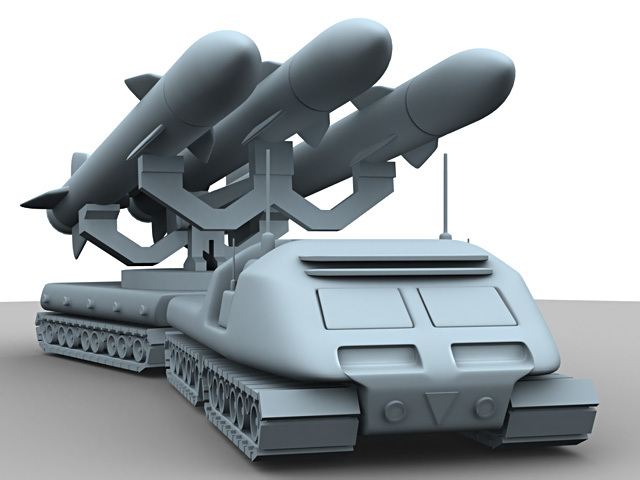 The images below were created with an entry-level 3D package called RayDream3D. 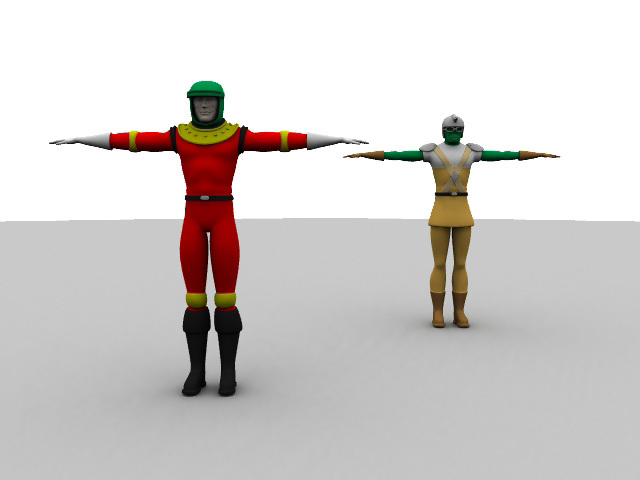 It was the first 3D software I learned to use, and these are the very first 3D objects I ever created (spring 1999). 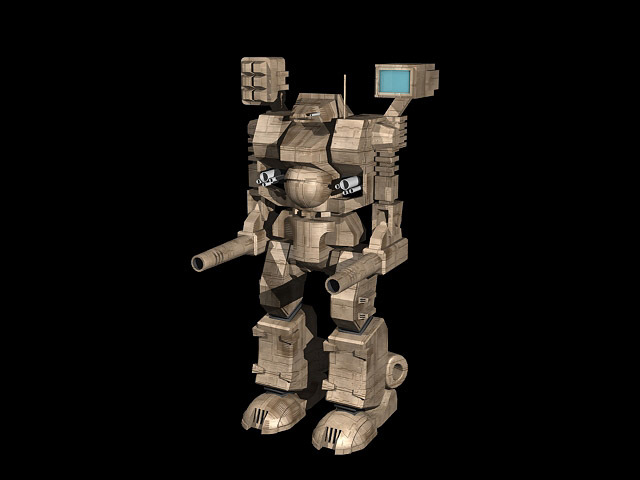 This is a BattleTech 'mech called a Warhammer. The only guidance I had was the cover art on the game box. 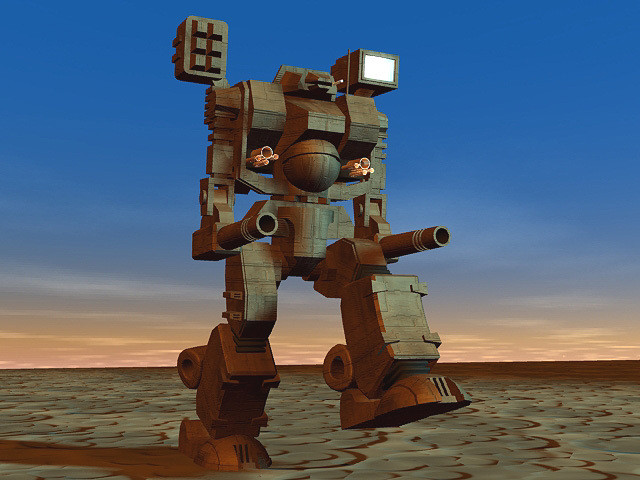 Here's the 'mech in a walking pose against a basic blue-and-brown "bi-gradient" background intended to suggest sky and ground. 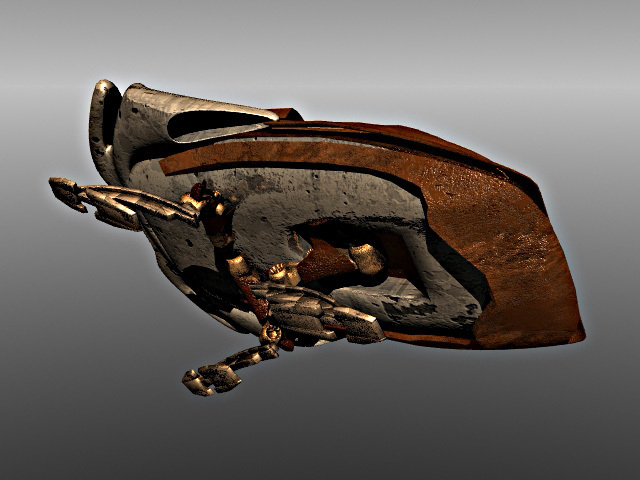 This is actually the very first original 3D object I ever modelled. 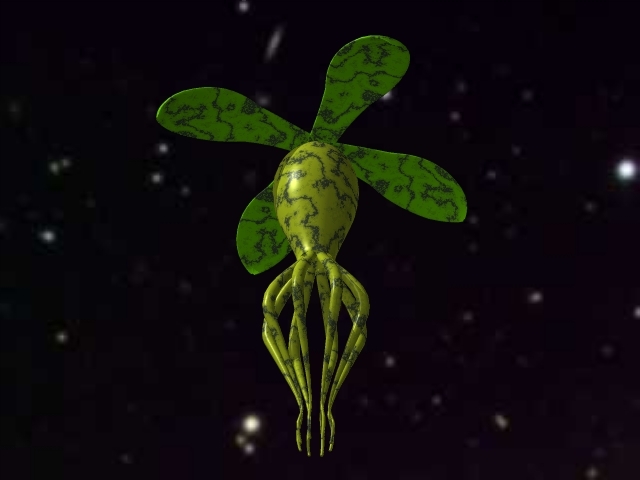 It is a Vorlon cruiser from Babylon 5. The starfield background is just a JPEG I got off some astronomy website. 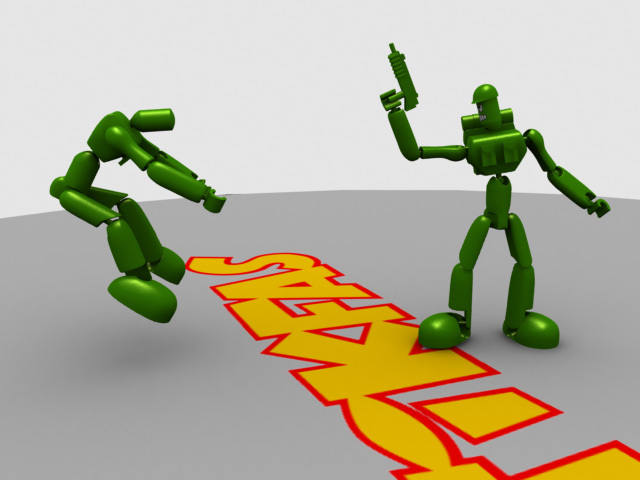 These images were created as part of a Lightwave3D workshop I took in the summer of 1999. Actually, it was three different workshops, a beginner-intermediate-advanced sort of series. I've provided one image from each workshop. This image is from the beginner class. 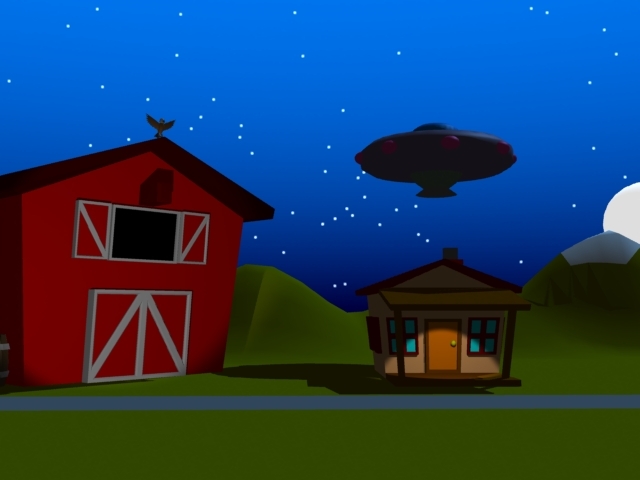 The class project was a cartoonish farm scene in which a UFO touches down in the middle of the street. The intermediate class project was a scene inspired by the movie Men In Black. 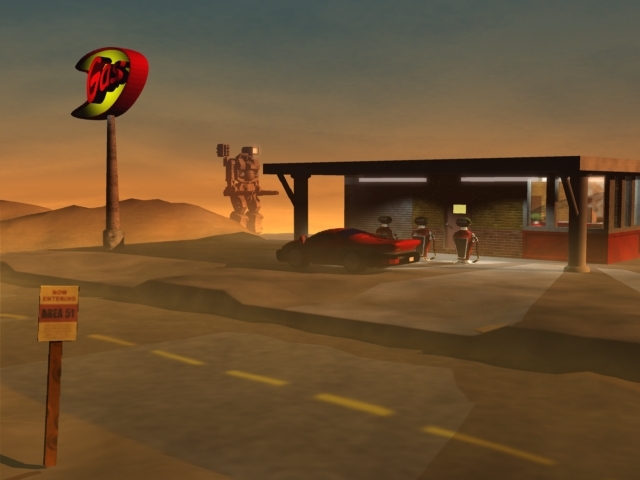 A MIB jet car is parked outside a desert gas station. You may notice the Warhammer Battlemech lurking in the distance. It was not a standard part of the project--I added it myself to spice things up. The advanced class project was a medieval fantasy scene in which a warrior encounters a giant serpent in its underground cavern lair. Students were allowed to choose from eight different characters to model for the scene. I chose the female paladin. 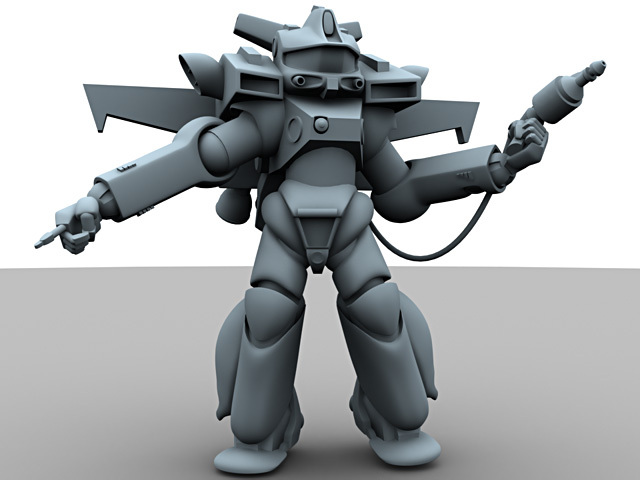 After taking the first Lightwave3D workshop, I decided to re-model the Warhammer using Lightwave3D. I finished it in time to add it to the intermediate class project as shown above. Our new Warhammer is giving us its standard neutral pose. 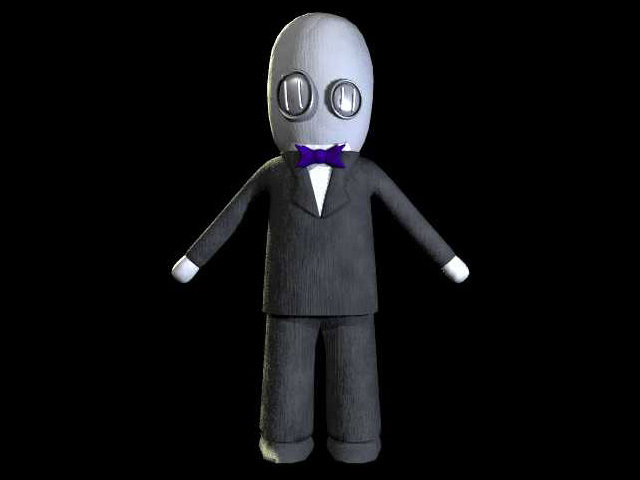 Compare with the RayDream3D version. 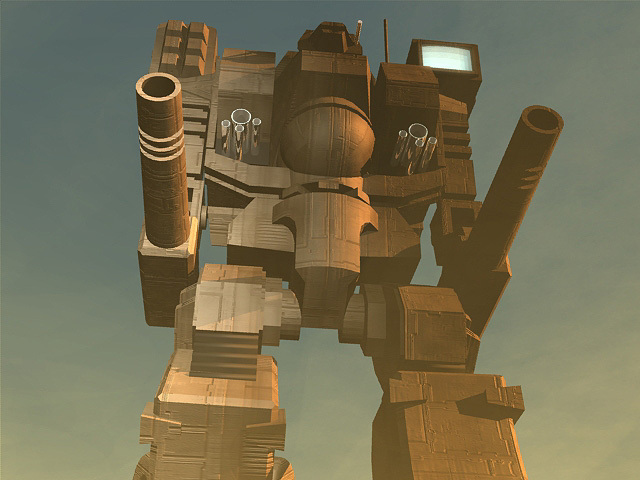 Notice the fancier texture mapping on this one. 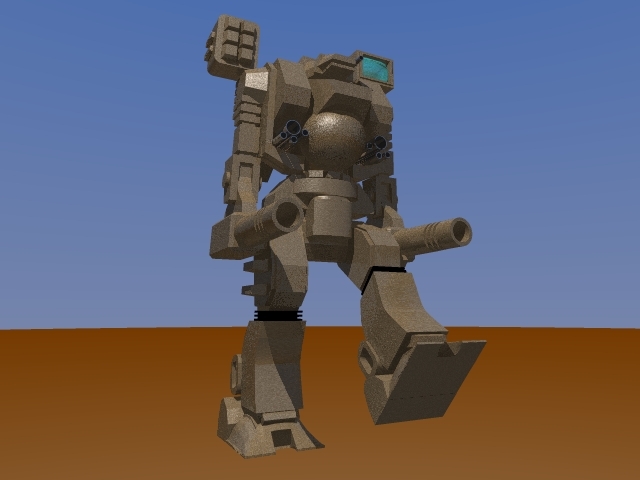 Here is a shot of the 'mech in the middle of its walk cycle. The background here is much fancier than in the RayDream3D series. I used SkyTracer to create the natural looking skyscape. 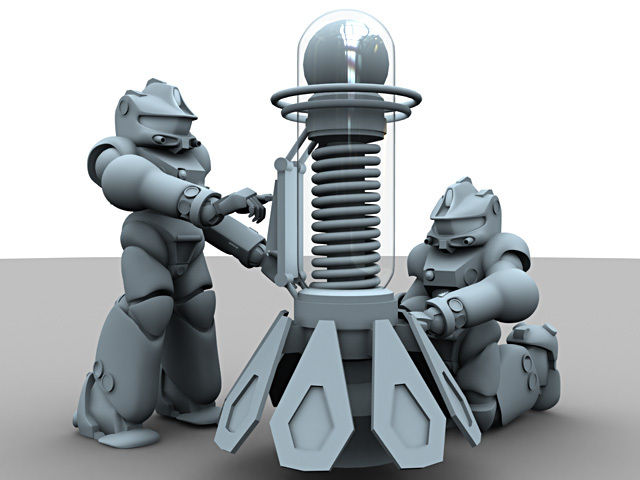 This is a frame from the very end of the intermediate Lightwave3D workshop class project. 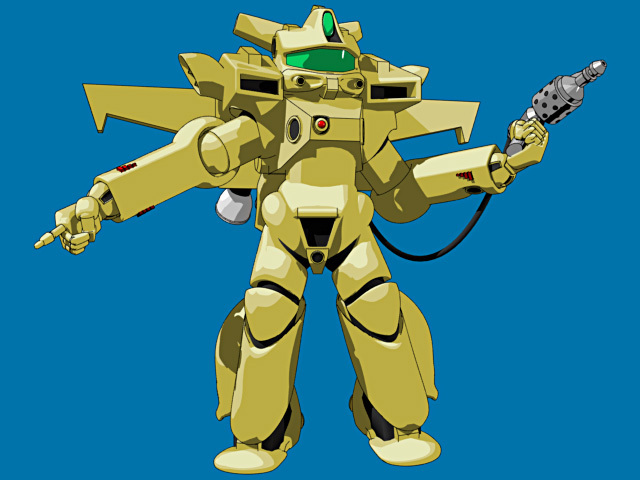 In the animation, the 'mech steps on the viewer. I was inspired to model a few characters from a wickedly funny independent comic book called Lenore. It is written and drawn by Roman Dirge, and I urge you to check it out for yourself. This bizarre little creature is called the Clock Monster and it appeared in Lenore #2. It was so damn cute I just had to model it. 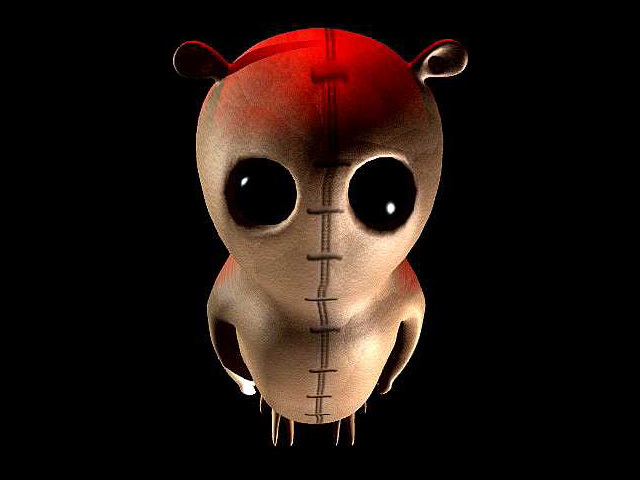 Lenore is the cutest little dead girl you ever saw, and even though she has no heartbeat, she still attracts boys. It's not exactly clear what Mr. Gosh is, but he is in love with Lenore even though she keeps killing him off every issue. 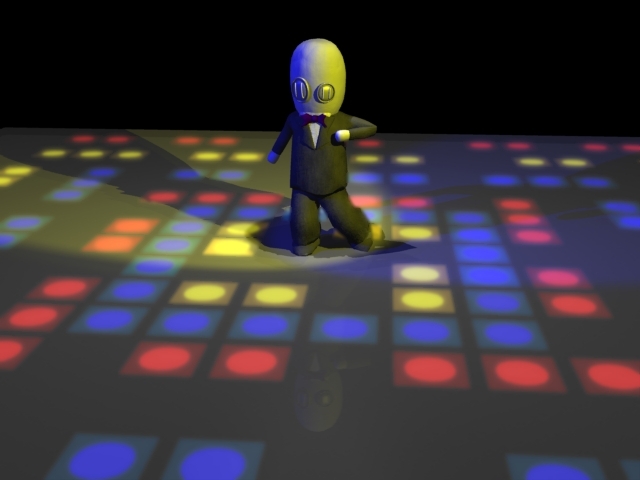 I thought it would be great to put Mr. Gosh onto a disco floor and animate him, matching his movements frame-by-frame to those of John Travolta in his famous dancing scene from Saturday Night Fever. One of the funniest, most entertaining cartoons to come out of Nickelodeon in years was Invader Zim. Sadly, the show was cancelled after only two seasons. 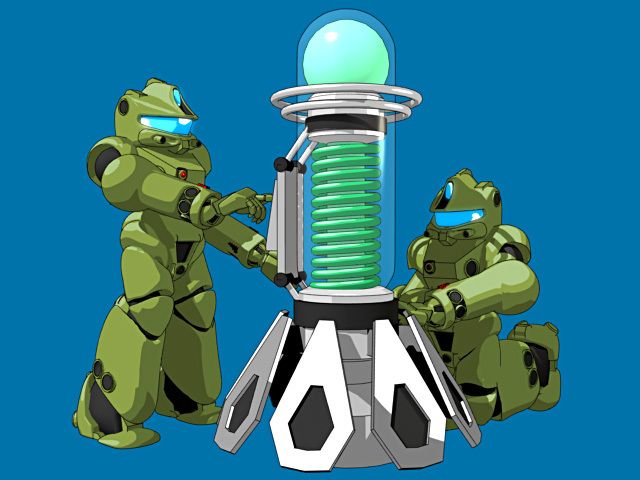 One of its most charming characters was Gir, Zim's adle-brained robot assistant. 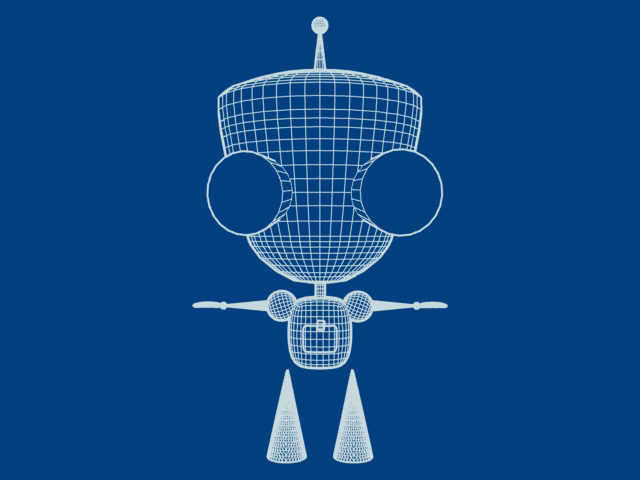 This is my attempt to model Gir in 3D. 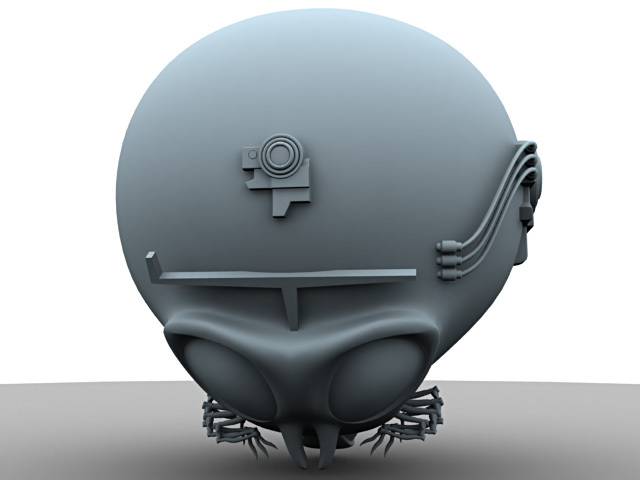 This wireframe render shows the model's underlying geometry. 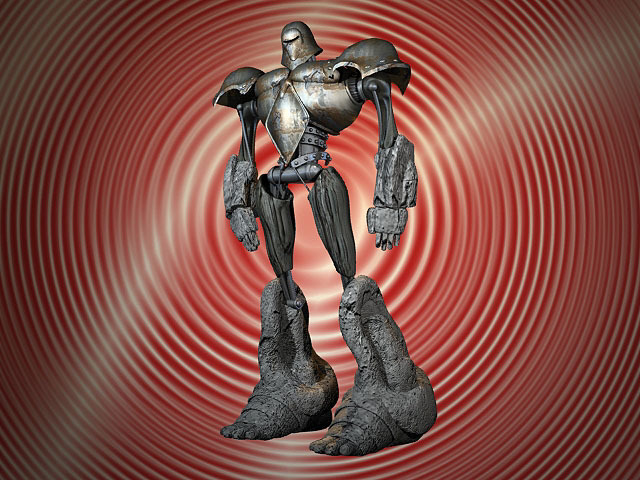 Note the high polygon density in the arms and legs. This is desirable since they would bend a lot when animated, and we want the mesh deformations to be as smooth as possible. 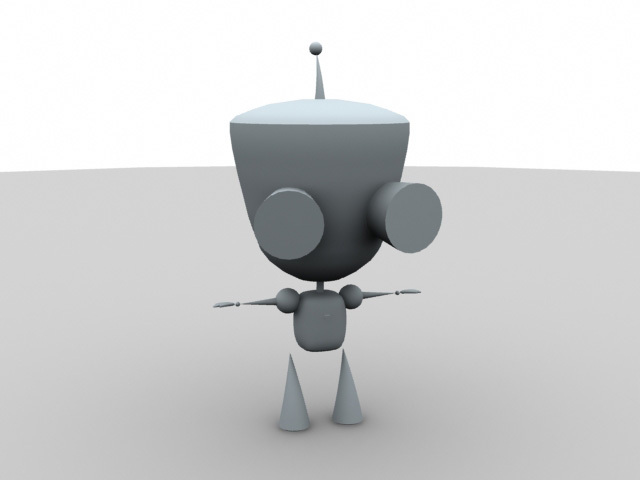 This radiosity rendering shows the Gir model in his full, underlying 3D form. 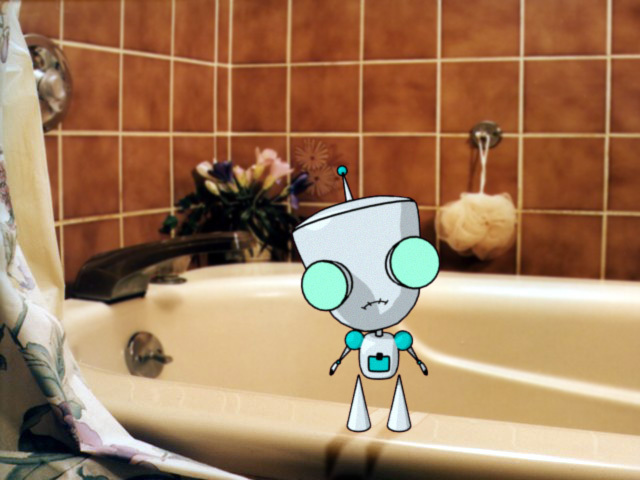 Here is a cel-shaded rendering of the Gir model, composited into a bathtub scene. 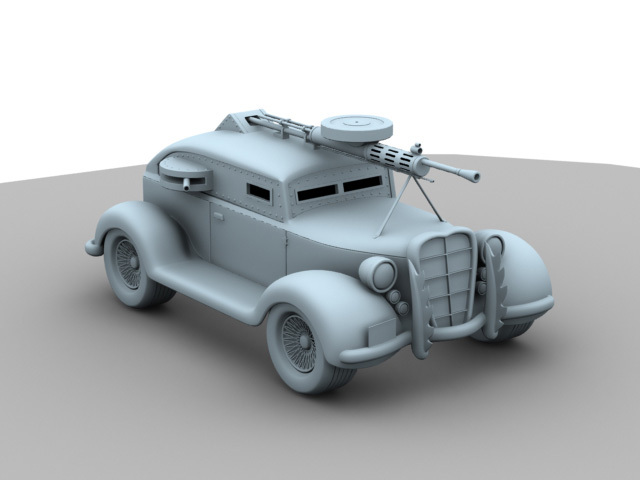 If all you saw was this kind of rendering, you might not ever believe it was generated from a 3D model. Here are some 3D logos I created for various projects. This logo was designed for the small independent film production company I worked for in 2000 and 2001, RGH Lions Share Pictures. The stylized gold lion was composited with the textured gradient in Adobe Photoshop. 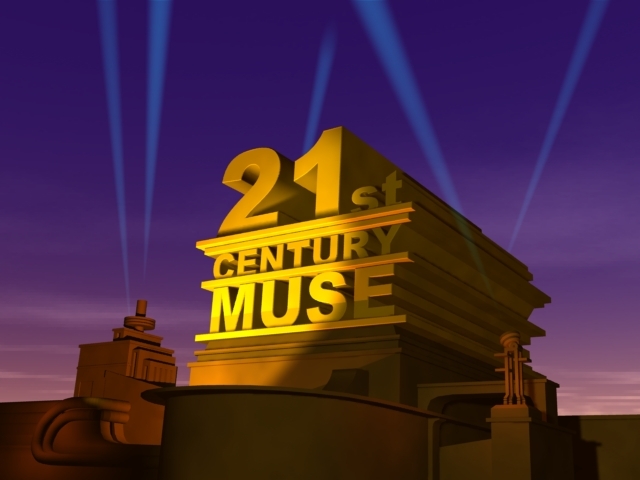 Here's an adaptation of the 20th Century Fox logo that I whipped up for use in one of my student films. 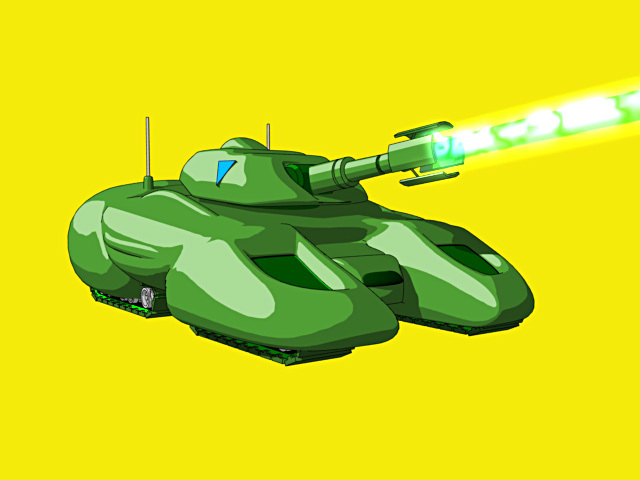 This is only the first frame of a 25 second animation which features moving light beams made visible via Steamer. 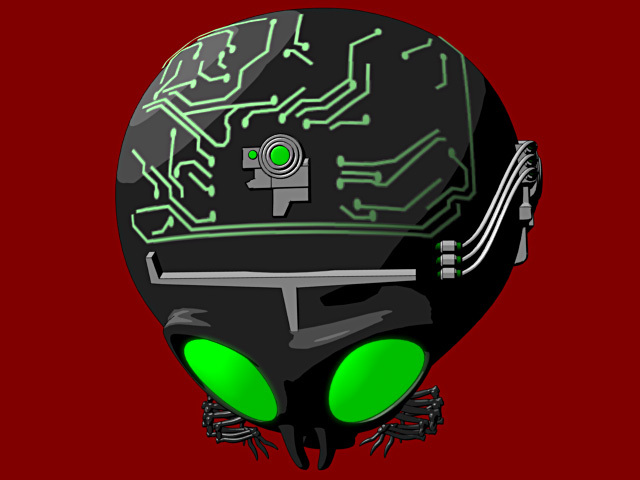 This logo was created as an exercise in the FX Academy program I took in 2002. We were told to surface the logo geometry in whatever manner seemed interesting to us, and then have it fly toward the viewer. I chose to surface it as if it were made of crystal. I then added scrolling and spinning heiroglyphic symbols in compositing. 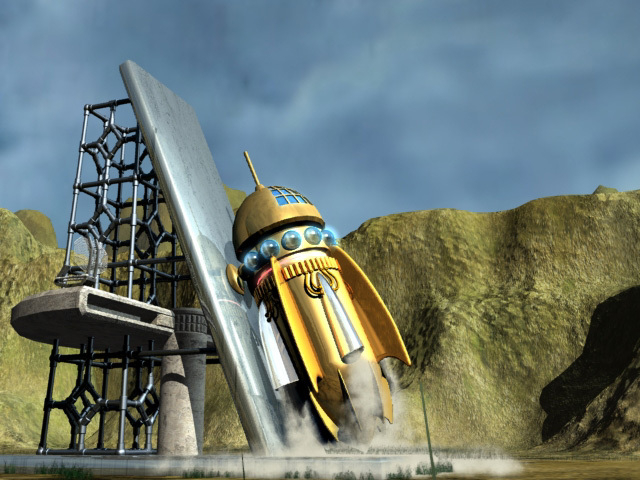 This is a series of test renders for a school project in which we created a short story involving Dan Dare, a 50s sci-fi comic book hero from the UK. Dan Dare and an enemy Treen pilot. The costumes were based on reference scans from a reprint of the original comic books. 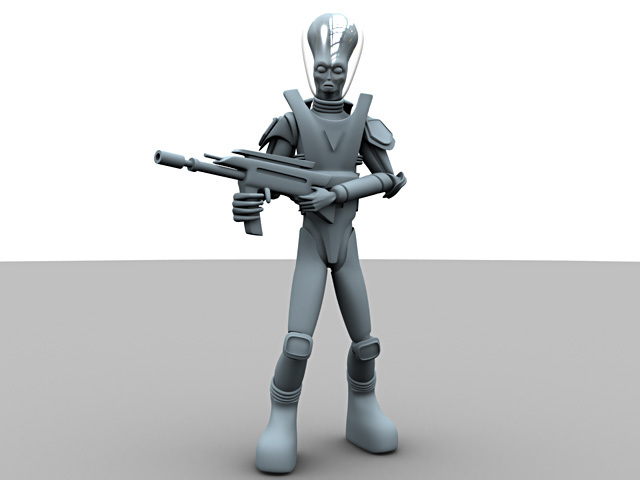 Dan Dare, untextured. 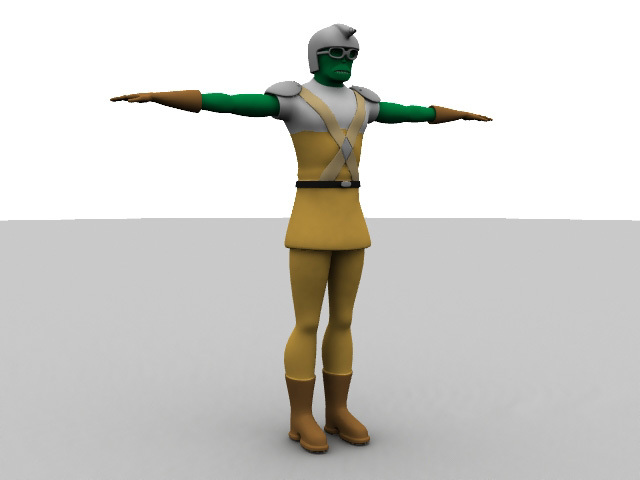 Treen pilot, untextured. 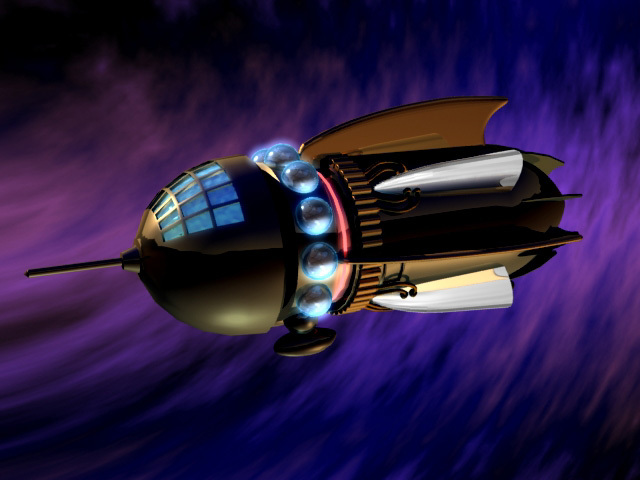 The short animation piece also featured our own take on Dan Dare's spaceship, the Anastasia. 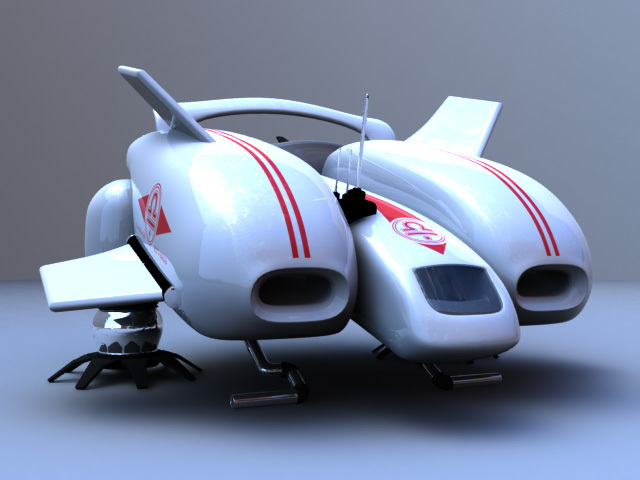 My version is based on the kind of ship designs prevelent in the early days of science fiction, such as Buck Rogers and Flash Gordon. My version of the Anastasia, flying through a nebula. A (radiosity) test render of Dan's ship. The Anastasia getting ready for take-off. 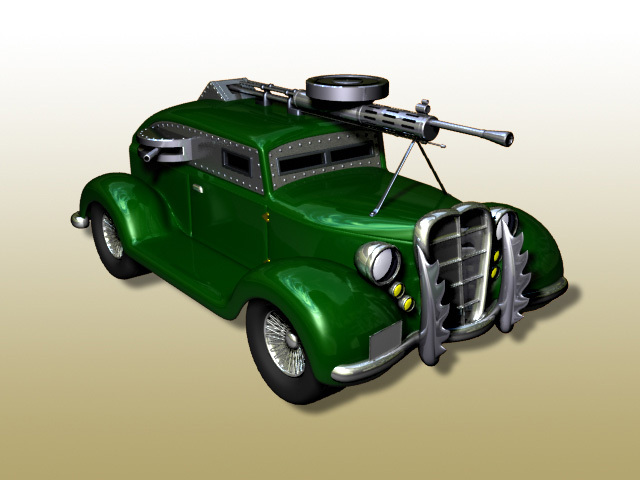 Here is a series of images of a car I modeled based on a design for the video game Twisted Metal. 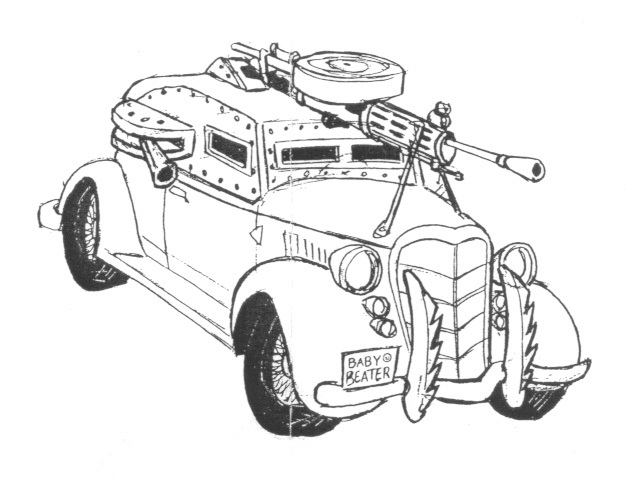 Here is the original concept art for the car. 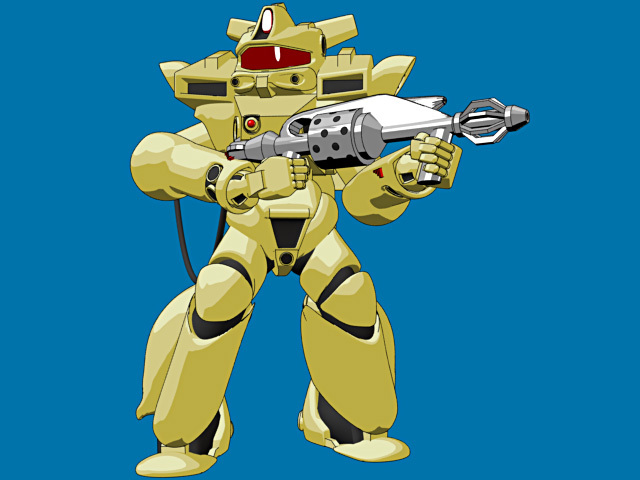 This was the sole image available to me for basing my model on. 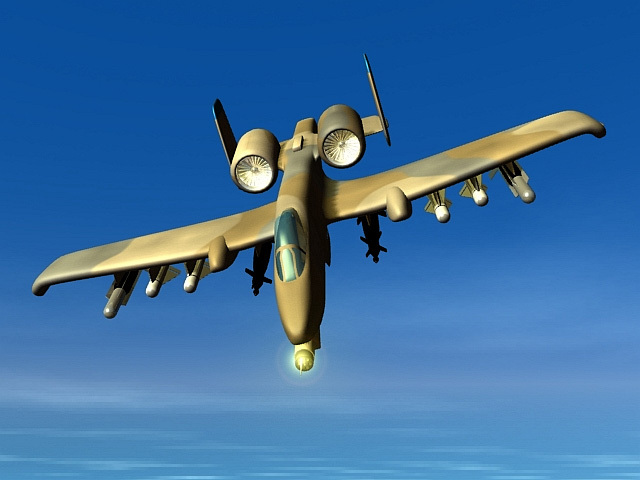 This radiosity rendering shows the completed, unsurfaced model. 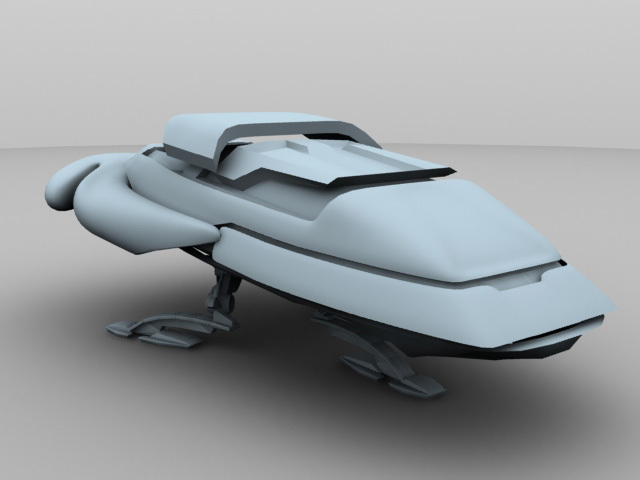 The model was then given a basic texturing pass to give it its essential surfacing characteristics. Subsequent texturing passes will add dirt and grunge. 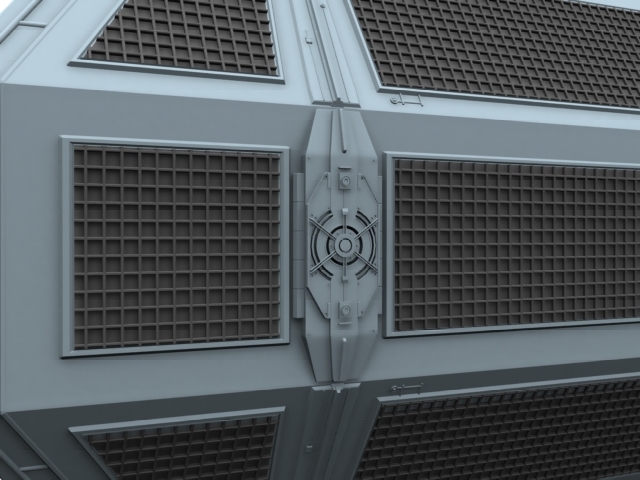 These images are from a vehicle I textured for the Linkin' Park music video for the Points of Authority remix. 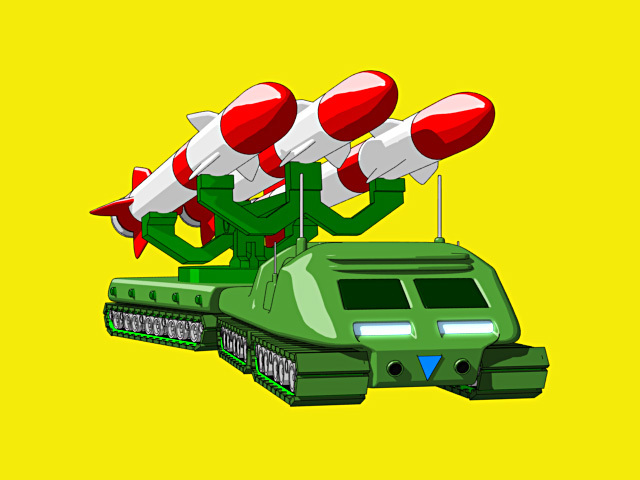 It is a demon troop carrier, and many instances of it can be seen landing in various shots of the huge battle between the demons and the robots. This radiosity rendering shows the basic model as it was delivered to me by the guys at Radium. 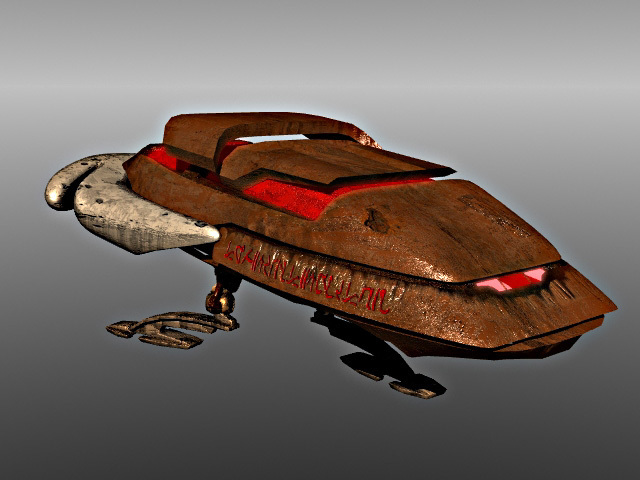 I added the rusty, grungy, beat-up texturing, as well as the alien lettering and blast marks. This is a belly shot of the model showing more of the landing gear. As art director for an effort to make a 2nd edition update of Avalon Hill's classic wargame Starship Troopers a reality, I had to produce all new unit counter artwork. 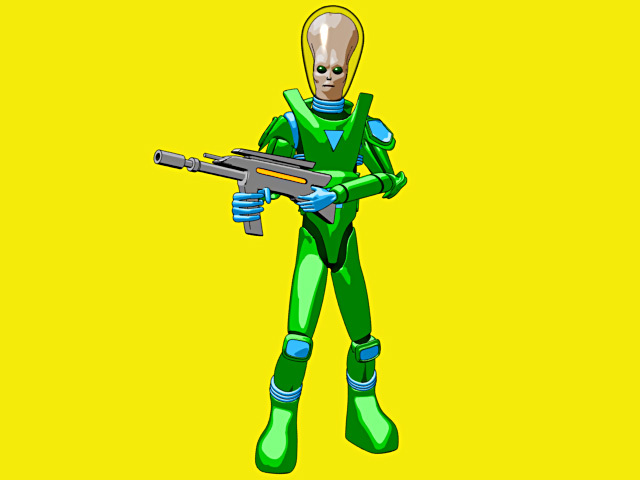 I decided to try a technique whereby I modeled the various figures in 3D and used LightWave3D's BESM cel-shader to produce 2D images that had a hand-illustrated look. Here's a series of images I created that aren't related to each other in any way. 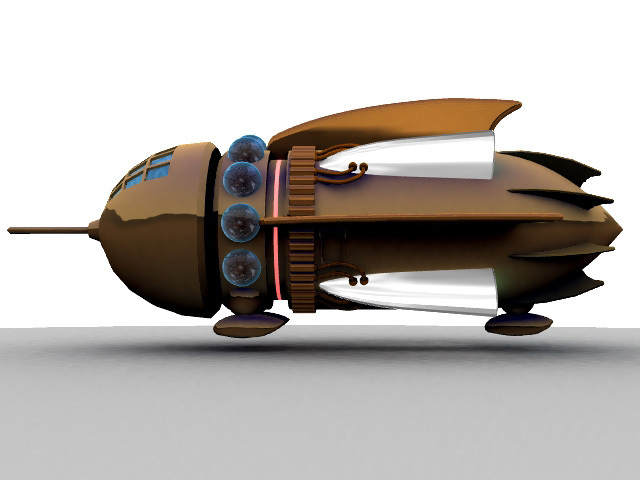 I designed this shuttlecraft for a project in which it is seen landing at Vasquez Rocks. Lighting was achieved through an HDRI light probe image generated from images taken at the Vasquez Rocks location. 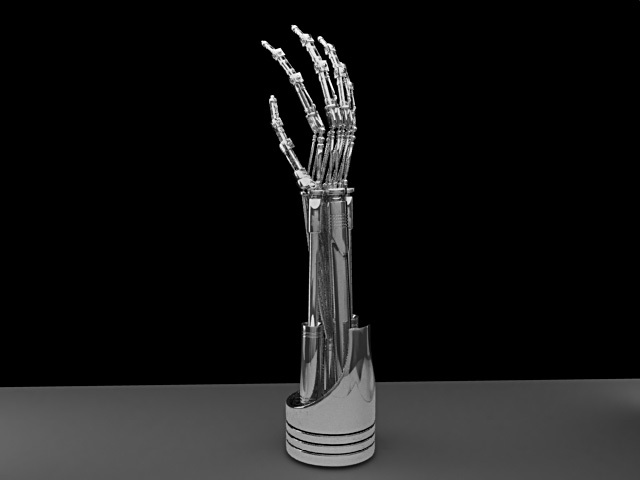 This is the Terminator endoarm from Terminator 2, used in promo bumpers by Access Hollywood at NBC. Fingers are all rigged for animation and linked to sliders through expressions. I thought it would be cool to model the Stikfa Alpha Military Male toy figure and animate a pair of them in a short bullet time scene. 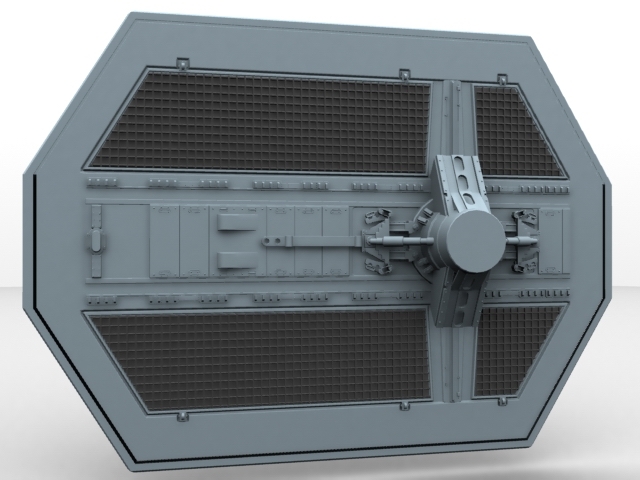 The outer side of a TIE Bomber wing from Star Wars. 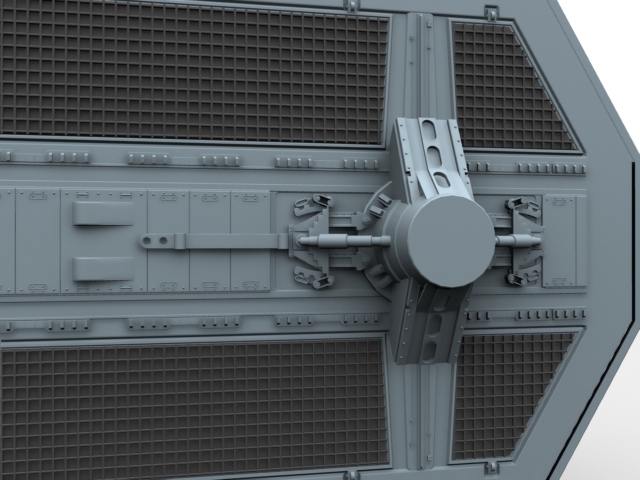 The inner side of a TIE Bomber wing from Star Wars. 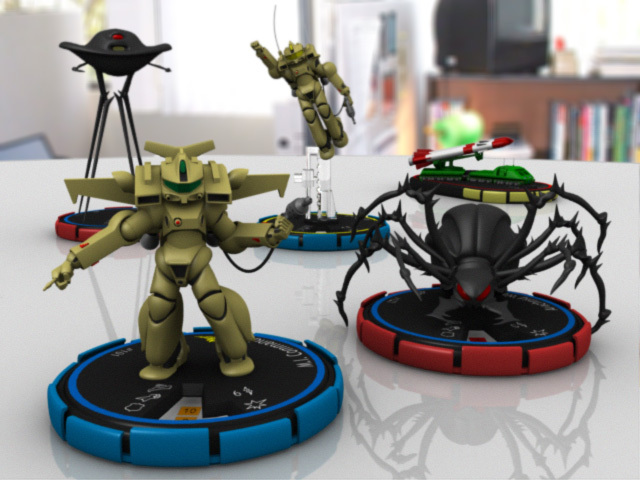 What might my Starship Troopers models look like if they were made into Heroclix figures for a 'Clix version of the SST game? Well, here's an image I created to give us a glimpse. The background is a defocused digital photo of a typical office space. 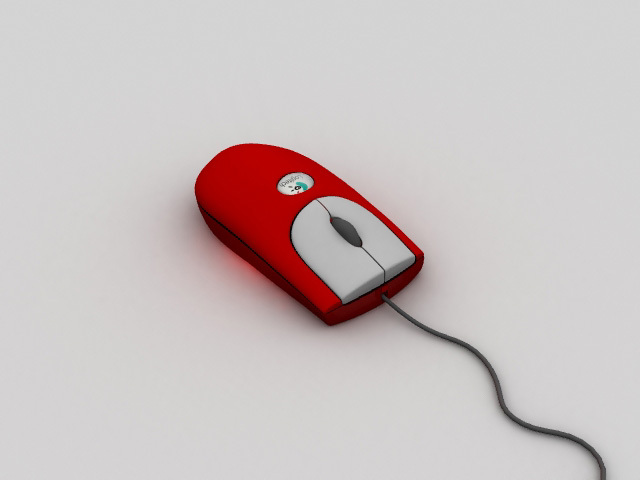 I was tasked with modeling the Logitech mouse found in our FX Academy computer lab as part of a project to model the entire lab. 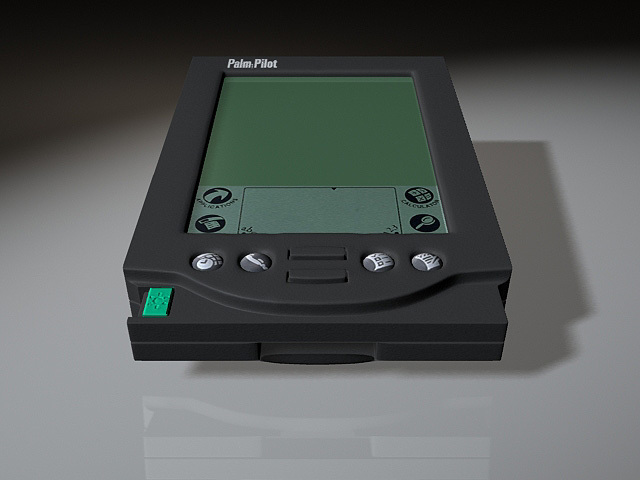 This PalmPilot was modeled, textured, lit, and rendered in 1 hour as an exercise in my FX Academy class to create an image suitable for Ekki Halka's One Hour Gallery. 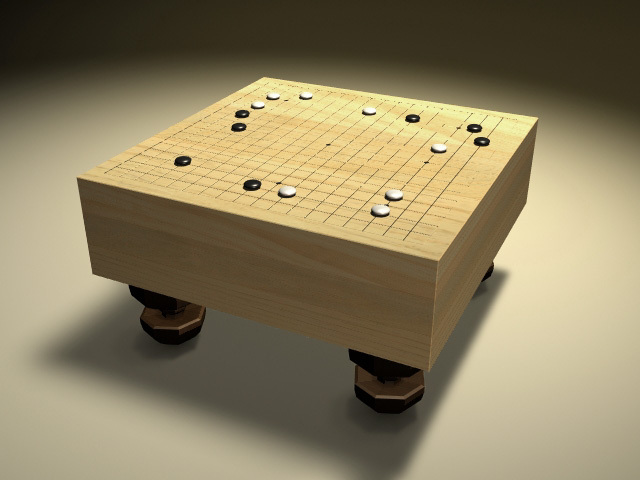 This go board was modeled, textured, lit, and rendered in a couple of hours. The geometry is extremely simple, but the wood grain textures and soft lighting help to evoke the elegant beauty of this ancient, exquisite game. In summer 1999 I went to the Miramar Air Show here in San Diego. I came back with a nifty wood model of my favorite military aircraft, the A10 Thunderbolt. 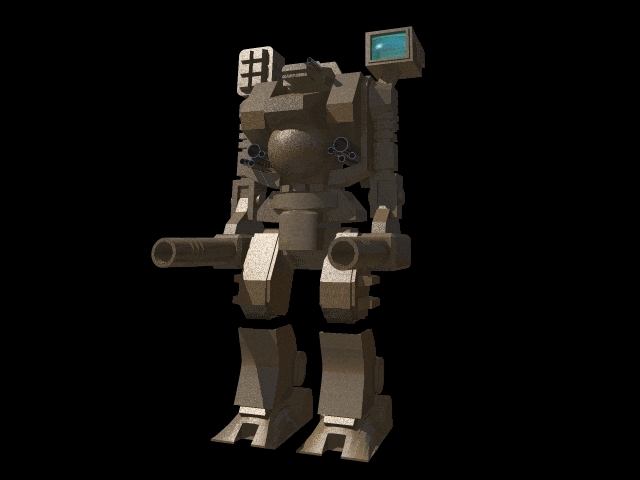 I was inspired to model it in Lightwave3D and here is the result, textured with camouflage and everything! In addition to my interest in 3D computer animation, I am also a novice guitarist. 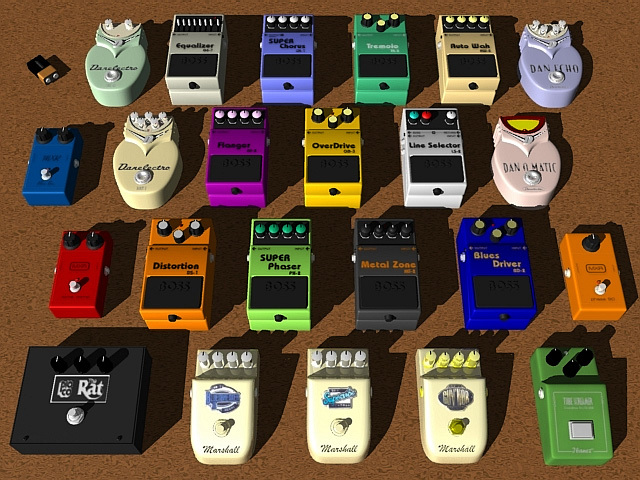 I was inspired one day to model some Boss effects pedals and ended up spending four days modelling all manner of stomp boxes. 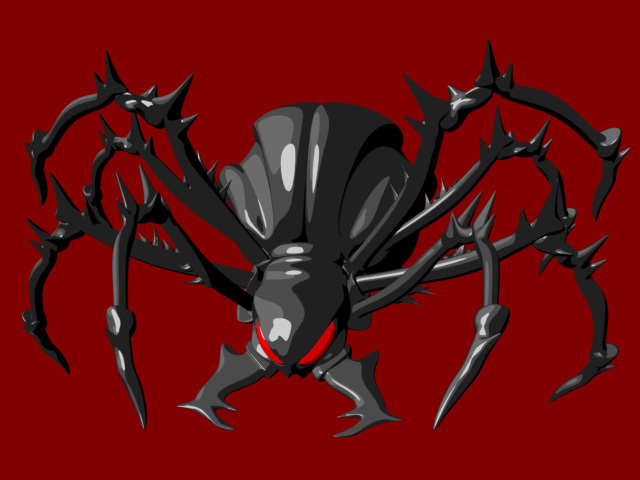 Here is my rendition of the Shield Guardian creature from the 3rd edition Dungeons & Dragons Monster Manual.